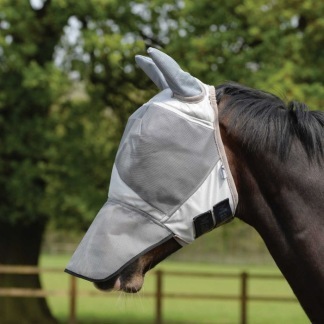 Our Ear mask with nose piece is ideal for protecting your horses eyes, nose and ears from insects and flies. The specially treated UV fabric offers great protection against the suns rays. Specially treated using UV fabric your horse will remain protected against the suns rays and the fleece covered edges provide a barrier against flies whilst preventing rubbing. Plenty of adjustment using the secure hook and loop fastening provides an optimum fit.